Thank you for your help with the course. I thoroughly enjoyed my time with Graeme and the course was very informative. Graeme was very enthusiastic and passionate about the subject and I enjoyed his tuition method. He has certainly taught me a lot about the theory of sailing and I hope I am able to put some of my lessons to practical use during my Atlantic crossing next month. So thank you both very much again for your sterling work. Just a quick note to say a very big thank you for my Day Skipper course. Graeme was superb, his relaxed but informative teaching methods were very welcomed and made learning a pleasure. He took as long as required to make sure we totally understood everything and his sense of humour made everyone relax whenever required. Without doubt Graeme is a great asset to your school and also to those wishing to learn practical things about boating. I would recommend your school to anyone thinking of undertaking RYA training. It was a thoroughly enjoyable experience. It was a very relaxed stress free learning environment. Graeme explained all aspects of the course so well, that when I read the RYA powerboat handbook, he had covered every section perfectly. 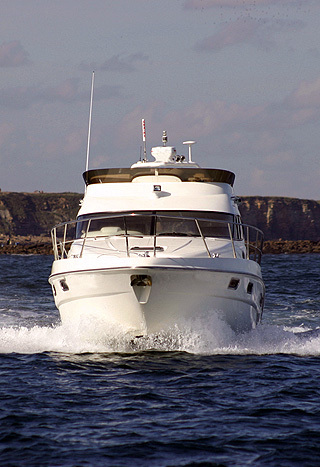 The practical side of the course was also excellent with close to 50 nautical miles covered mainly on the Sealine F37 learning aspects of low speed control in the marina, river pilotage and some work out at sea around Cullercoats and Whitley bay. 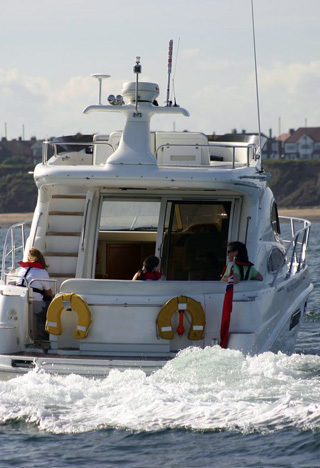 It was also good to experience this on the 5.8m rib which oceanic offer. I will certainly return for the day skipper course. I wanted to send a note to say thank you to everyone who was involved in the charter experience we had on May 7th for Andrea's 40th. Graeme and Barry were great and really made everyone feel at home on the yacht. The two ladies who also assisted (I did not get there names which is awful) were brilliant as well, making sure everyone was really well looked after and had everything they could possibly want. The yacht far exceeded my own expectations and the pictures on line really do not do it any justice. The comments from my friends were great too, all saying that it was an amazing experience like nothing else they had been on before. Everyone was blown away by the welcome we received and how the day went, I could not have asked for anything better. Again, my thanks to the crew that were on board on the day, and to you for helping to organise everything. Thank you Graeme for a most enjoyable Helmsman course, something we both got a lot out of! Hi, just a word of thanks. My wife and I both completed our radio course yesterday, and I would like to feedback to you what a great business you have. From Dee taking bookings to Graeme's instruction your employees are a credit to you. Thanks again and we shall be in touch for our next course. I write to thank Oceanic Sea School and specifically Graeme for conducting such an excellent course. I thoroughly enjoyed his style of tuition and learnt a huge amount from him which will add to my enjoyment of sailing my yacht (MIJ II) at Royal Quays in the future. It is also such a benefit to be part of a small group of students, so we can move along at a much quicker pace. Your new training facilities, coupled with coffee breaks and lunch on “Oceanic Moon” combined to make me look forward to my next course. Thank you so much for all the courses, the knowledge I have gained is for sure invaluable. I cannot wait to do more, although the next theory course I am sure I'm going to find challenging, but still looking forward to getting it done. I am so so full of praise for the school and to both Graeme and Barry, their teaching methods are fantastic and I am confident putting into practice what I have learnt. I am also safe in the knowledge that if I encounter any problems or don't understand something I can ring and know they will be of help. I cannot sing their praises enough. Upon arrival at Royal Quays we were made to feel very welcome and instantly felt at home on the yacht. Over the four days spent with our instructor Graeme, he was very patient, absolutely courtesous and made our training very enjoyable. He has excellent skills in handling people, his sense of humour was lovely and he made us feel at ease whenever we met him. At all times he was professional and went out of his way to give us as much experience with the practical side of boating. I had no practical experience of sailing before attending the course and I was slightly nervous about it, now I cannot wait to get on a boat and go around the coast of Britain. The enthusiasm I now have is all thanks to the professional way that Graeme instructed myself and my partner. 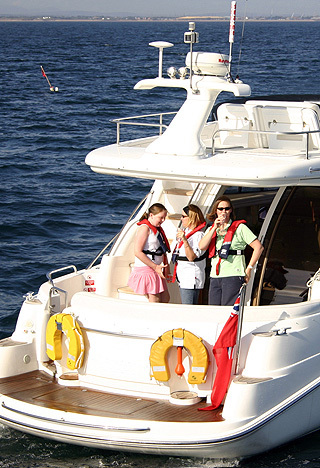 I would recommend your company to anybody wishing to attend a sailing course. Thank you all for a most enjoyable Day Skipper Course. I would just like to drop you a quick note to say thanks for the excellent, professional and most enjoyable course I have just completed with yourselves, after originally just booking an ICC course but spending time on the yacht and under such professional instruction I was hooked, so much so that I quickly booked my Day Skippers course!! The service I was supplied from day one of making my enquiry was fantastic and I would not hesitate to recommend your company or training school to anyone. Many thanks again and looking forward to more time aboard. I would like to send my thanks to yourself and the team for the support during the recent Day Skippers course. The tuition and management of the course was excellent and I learnt an enormous amount over the four days.